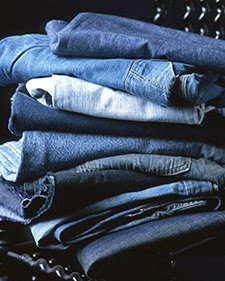 Okay I talked about things I'd like to do this year in 2010 and one of those things is a project I've been collecting DENIM pants for...forever! My husband is tired of moving the bag of jeans around and I have them from when my kids were little all the way to present day. I originally had wanted to make a camping quilt...you know the traditional quilt with squares and a red plaid flannel on the back side...but when I saw this today, I changed my mind and I think I bit more motivated. 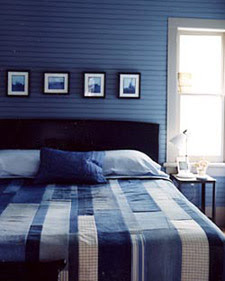 It's a fun quilt with strips of denim...loVe iT!!! Check out the other stylish things they did over at Martha Stewart using denim...have to love those MS team members that think these things up!! So hopefully before the end of this year I can show you "MY DENIM" quilt! !